Last week Chaz and myself made a visit down to Sedona, AZ in the wee hours of the morning for some sights of the Milky Way. I had a spot in mind I visited during a portrait shoot earlier in the year and after hiking a couple miles in the dark we found the tree I wanted to shoot. We passed several deer and more spiders than we could count but it ended up being worth the trek. Below are some images from the trip. View to the Southwest of our home galaxy. The tree I wanted to shoot actually ended up being one of the last shots I took. One of the spiders along the trail. It’s a giant crab spider and was the size of a half dollar of not bigger. They aren’t poisonous but will definitely hurt if you get bit. Looking forward to more shooting this season, and my workshop coming up in June at the Coconino Center for the Arts. Recently Think Tank reached out to me to see if I would be interested in partnering up with them. I said I would be more than happy, they make some of the best gear I've ever used. My favorite bag of theirs is the Retrospective 10. I've traveled with it overseas for years and it is still in awesome condition. Part of teaming up with Think Tank is that my followers and friends get a free gift with their purchase AND free shipping in the US. If you end up with some of their gear, I'd love to hear what you got in the comments below! Full disclosure: I may receive a small percentage of the sale. I have some very large images on display. I will return during the day to get better interior shots. For the month of March myself and Nashdoi have a dual display up at Firecreek Coffee. I have mostly night images with a few day time ones as well as a couple black and whites I captured last year. Nashdoi has a series of all black and whites captured around our great state of Arizona. His work is phenomenal and if you are located downtown its absolutely worth checking out! 2017 has been an incredible year full of night adventures across the Southwest United States and more art shows than I can count. Below are many images that summarize my year of growth across the art scene. 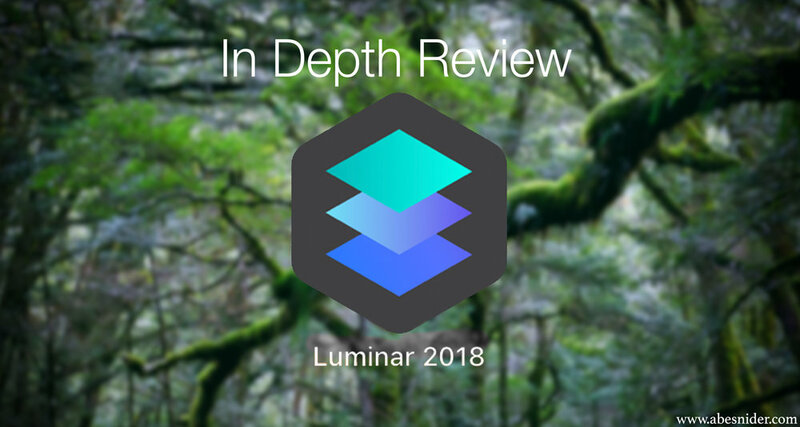 The 2018 edition of Luminar is the latest from Developer Macphun (soon to be Skylum as they are no longer creating Mac only software) and is meant to compete with the likes of Lightroom and Affinity among other popular photo editing software. When I first saw an ad several months ago for Luminar I dismissed it as another attempt at competing with Lightroom or the countless other programs for processing RAW files. I am pleased to say after using Luminar for the past week I am VERY impressed. It's not perfect, but instead is a very powerful image editor that easily stands on its own. I could see how many photographers could make the switch from Lightroom or other image editors. Read on for an in depth review as well as a breakdown of the 50+ tools at your disposal. I have another post I'll be sharing soon on Astro workshops but just thought I'd share I won the Shoot the Frame 2017 Landscape award for my image of Grand Falls and the Milky Way! I'll be at Naked Mobile for April First Friday! Hope to see you there! At the beginning of this year I was nominated for a 2017 Viola Award under the emerging artist category! I am incredibly honored and really can't believe I made it to the final round of nominees. This past weekend was the award ceremony and although I didn't win it was awesome exposure and a great experience overall. Below is my nominee video where you can see me talk about why I continue to do what I do. Also is a link to the page on the Flag Arts website with my bio. Here is the link to the page, where you can see other nominees and the winner for each category.